Preheat oven to 400 degrees. Mix all ingredients together, except Pam cooking spray and potatoes. Spray a cupcake pan with the cooking spray. 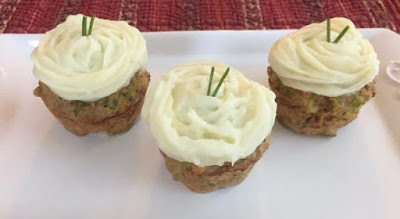 Pack meat mixture into the cupcake tins and bake for 25 to 30 minutes. Let cool slightly and decorate the top with mash potato frosting. If you'd like a printer-friendly version of this recipe, Click Here.